Last week I needed a salad that could pair with a pinot noir. This isn’t something that you see everyday…I needed big flavors to stand up to this robust wine. 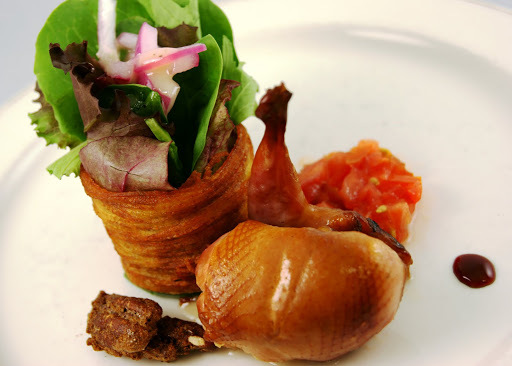 I settled on Roasted, smoked quail with field greens tossed in a caramelized shallot vinaigrette in the potato crisp. The potato crisp again. I’m a fan of it because it brings so much to the plate: Height, texture, and flavor (who doesn’t like potato chips?). One of the things I like best is that you can give a refined presentation to leafy greens, which can otherwise look arbitrarily heaped on a plate. The down side is that they are a real pain to produce and you risk creating a mutiny in the kitchen if you need too many. If you make them too far ahead of time they will inevitably absorb some of the moisture of a humid kitchen and will need to go in the oven briefly before plating. The greens were tossed in a caramelized shallot vinaigrette beforehand, the sweetness of it working nicely with the tart tomatoes, the salty potatoes and the smoky, brined quail. For the vinaigrette I used sliced shallots that had been seasoned and slowly caramelized, honey, fresh thyme, apple cider vinegar, white balsamic vinegar, whole grain mustard and salad oil. The ratio was roughly two parts oil to one part vinegar, with just enough mustard to emulsify the vinaigrette, honey balance the flavor and the thyme was added at the very end. One thing to note is that any time you use fresh herbs in a vinaigrette they will lose color quickly, so if that’s important to you then wait until just before service to make the vinaigrette. The red onions were acidulated with a solution of water, distilled white vinegar and granulated white sugar. I like to soak strong onions in water to remove some of the acid that makes then so pungent, leaving only the natural sugars. Adding vinegar to the water turns the red onion to a hot pink color. A little sugar will balance the tartness of the vinegar. The heirloom tomatoes were cut down to a small dice, then tossed with olive oil, a fine mince of fresh shallot, chopped herbs (parsley, thyme, chive), then seasoned with kosher salt and white pepper. Overall this was a dish that I would prepare again and it paired nicely with the wine. Posted in Appetizer, Fall, Game, UncategorizedTagged pecan, potato, quailBookmark the permalink.